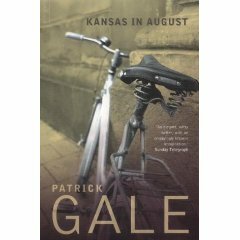 Kansas in August by Patrick Gale – It's Time to Read! In this first novel, Dr Henry (Henrietta) Metcalfe falls for a hitch-hiker, Rufus. A psychiatrist and a teacher, both are intent on concealing their true identities. To complicate this comedy of sexual role reversal, Rufus is having an affair with Henry’s brother, Hilary, who wants to be a father. I don’t really know what to make of Kansas in August. This is certaintly not the best Gale book I have read. The book seemed disjoined, with random characters flitting in and out of the story. There seemed no definite storyline, we just seemed to follow three character, Hilary, Henrietta and Rufus through odd events which distantly relate the characters to each other. I didn’t like the ending, which I honestly was begging to come. I don’t feel the story is ended and I’m left feeling completely unsatisfied. All revelations could have come a lot earlier in the story. That I think would have made the book improve vastly. It was not a long book, 158 pages, but one I did consider putting down a few times. I didn’t really connect with the characters, there was nothing about any of them that I could relate too. I’m left disappointed really.